‘Tis the season for making merry! We know how hectic the lead up to Christmas can be, which is why we are keeping this low key. 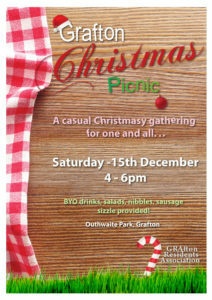 Mark your calendar and join us on Saturday, December 15 between 4-6pm in Outhwaite Park. We would dearly love to see you. There will be a sausage sizzle and a few games, so please BYO libations, salads and nibbles! From all of us at GRA, we wish you a wonderful holiday season.